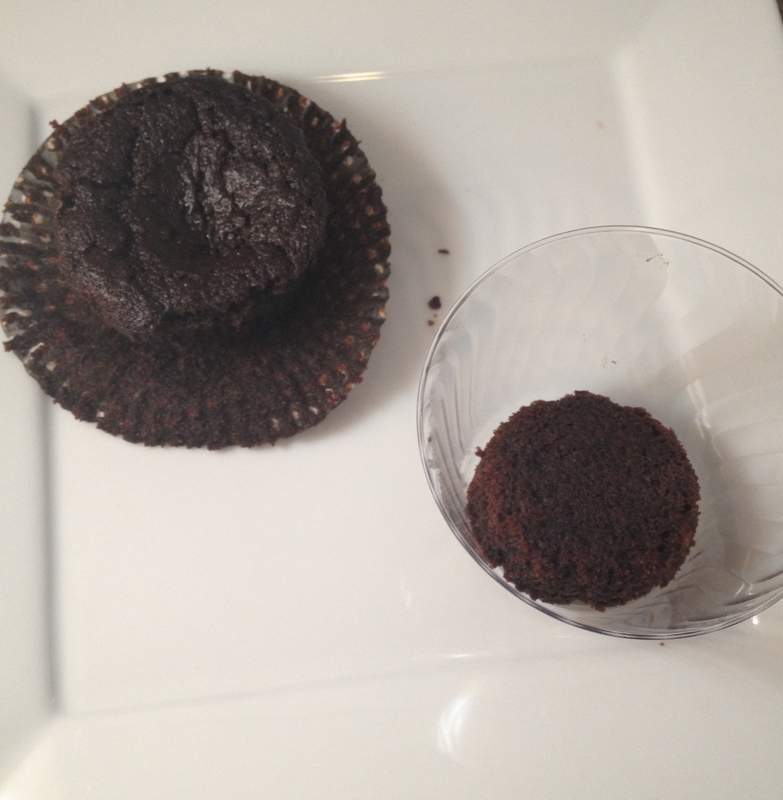 Yesterday, on my appearance on Better Kansas City, I shared my favorite chocolate cupcake and chocomole frosting. 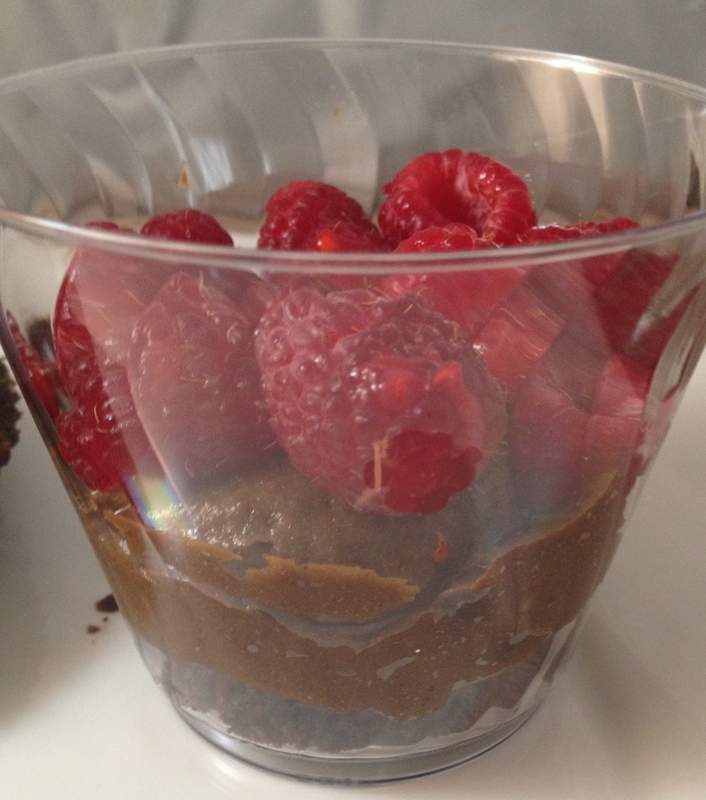 I’ve turned my TV leftovers into a dessert that may be even more decadent than the original! Leftovers? Leftover cupcakes? Yep. I’m a bit of a perfectionist about my recipes. Not so much that they be impeccably formatted (maybe you’ve noticed) or that they have some specific nutritional balance (just healthy ingredients works for me), but that they actually work and taste great. So every time I’m going to be on TV, teach a class, post a recipe here, I find myself testing a few times just to be sure. Which means I had lots of cupcakes and lots of frosting from my TV appearance. What’s a girl to do with several batches of frosting staring her down every time the refrigerator door is open? Make trifles! Here’s all you need to do this: a few fresh raspberries, one batch of Chocomole frosting (recipe below) and one batch of My Favorite Chocolate Cupcakes. I used small plastic punch cups to make these for a couple of reasons. First, I could share these with friends and neighbors and not worry about getting a container back. Second, the shape of the punch cups follows the shape of a cupcake, narrower at the bottom, flaring at the top. These can also be created in small mason jars. Slice each cupcake in half. Place bottom of cupcake in the bottom of the cup. 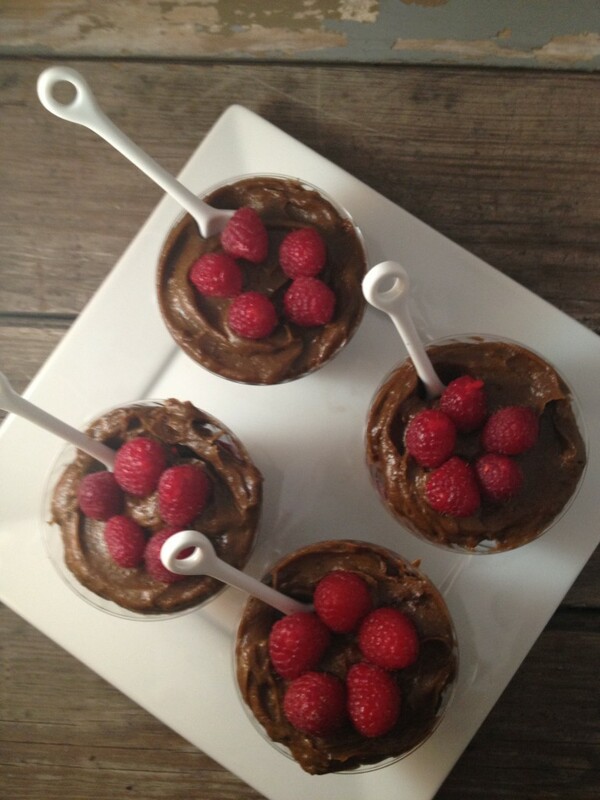 Top with a layer of chocomole frosting, following by a layer of raspberries. Top with remaining half of cupcake. 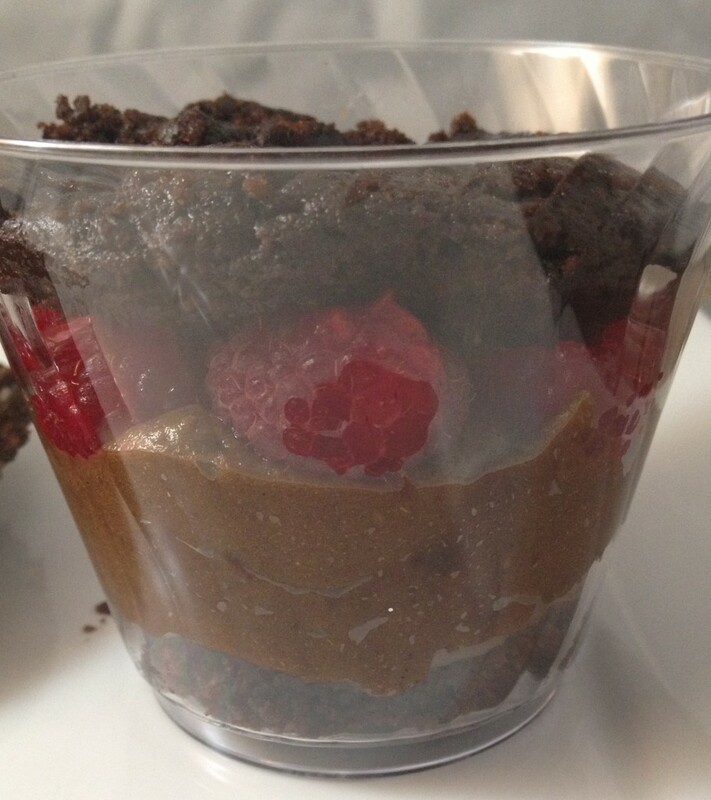 Finish with another layer of chocomole frosting and a few raspberries for garnish. Store these in the refrigerator until ready to serve. If you are using a food processor 11 cups or smaller in size, please consider splitting this recipe in half. In food processor, place dates and process until finely chopped. They will turn into a ball of date paste in the food processor. Slice the avocados in half carefully. Remove the pit and spoon out the fruit. Place the fruit into the bowl of the food processor. 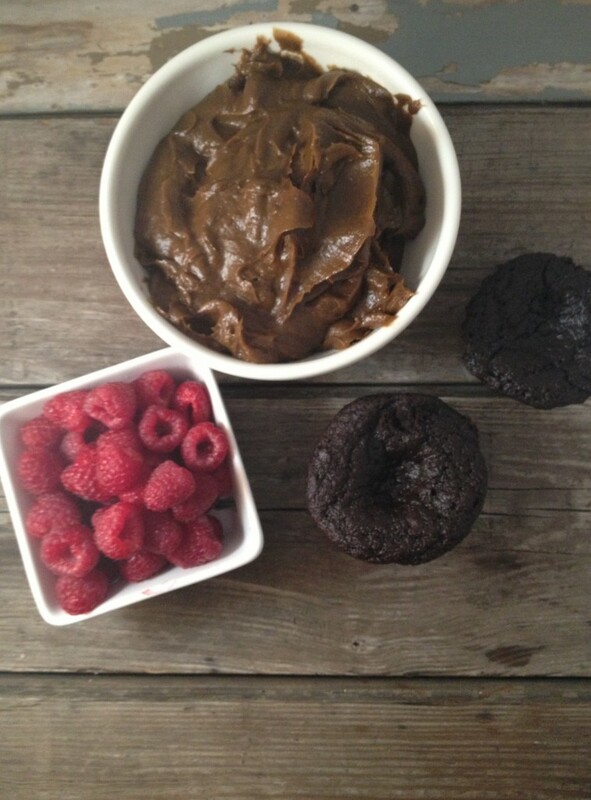 Add the cocoa powder, coconut oil, agave nectar and vanilla bean paste to the food processor. Process until smooth, at least a few minutes. Slowly add in milk, until desired frosting consistency is reached. Pipe or frost with a knife onto cupcakes. This frosting is best kept refrigerated. Thanks, Shirley! Finally, a refined sugar-free frosting that speaks to me. I think I’ve found my buttercream replacement.